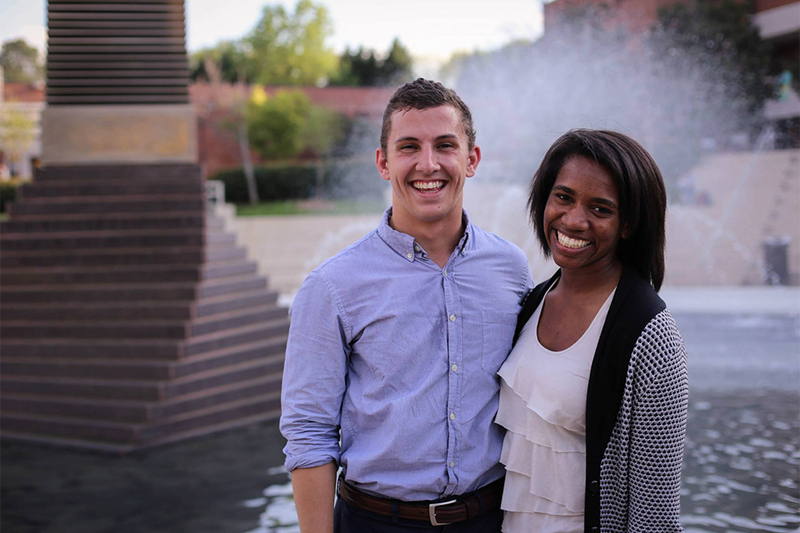 As the 2015-2016 school year kicks into motion, the Undergraduate President and Vice President prepare to create a new executive board to faithfully represent the student body. Jennifer Abrams, fourth-year Public Policy major and current president, and Jefferson Losse, fourth-year Mechanical Engineering major and current vice president, sat down with the Technique to talk about plans and preparations for the new school year. Technique: What new initiative are you most excited for the new year? Jeff: Two things that we’ve already done so far that I’m already really excited for are the campus safety app and a new mental health portal. The app is rolling out the first of September and is now fully functional, so students can go and download that right now if they would like to. It’s just LiveSafe, if you’re familiar with it, but that will replace JacketGuardian. We’ve also been working with the counseling center. I know in our platform we discussed the new mental health portal for the website through the counseling center. That is now live at united.gatech.edu and has been in progress for the past year now. Technique: What’s new with the mobile app? Jeff: This kind of runs with our platform in the campaign — that we want to make things that you can use as a student as user friendly as possible. When you pull up this app, it takes two seconds to boot. It’s a very simple UI that you can use. One of the big strong points of this is there are anonymous tips and reporting. Through surveys we’ve found that people don’t want to put their name down whenever they report a crime or anything that might not necessitate as a crime. It might just be something minimal, that they don’t think is necessary to call the police for. So with this app, you can report any number of items, and it’ll go right to GTPD, not to the Atlanta Police Department, because when you call 911 it’ll go to the Atlanta Police Department, and then they’ll go to the GTPD, so there’s a lag in communications. Jen: That committee falls under the vice president of student life. In the first semester their biggest role is going to be to helping to usher in the director for the Center for Community Health and Well Being. That person will be chosen in the next two or three weeks; there’s been a national search going on since last spring. And that committee, [under] that person, will really be working with this new center that we have. What are our students like, what do they need, what do we see as the needs of our students in the area of wellness? They have been meeting with the directing staff over at the CRC, health promotions and STAMPS, and identifying the ways that they have wanted to reach out to students in the past and maybe didn’t have the best ideas or ways to do that. Basically, how can SGA really be helping more in that area of campus, to reach out more to our students. Technique: What can SGA do for students that students aren’t aware of? Jeff: We cover such a broad expanse on campus. I would really recommend, if I could recommend a student do anything, is to invest a little bit of their time in SGA, and just kind of figure out what we could do for them, because we hit just about every facet of campus. We work a lot with parking and transportation, academics, athletics. I don’t think people understand the scope of what SGA does, what they can do. One of the big things that we’re trying to address right now is that there’s 14,000 undergrads that we’re trying to help, and if they have an issue, they don’t necessarily know to reach out to SGA. It’s kind of a two sided thing — we’re wholly invested in the students, but we also need them to be invested in us, so we can turn around and help them. Jen: One of the biggest things that students can always do is that if something comes up, if there’s an issue, even if it’s just a question, always to let us know, or just to ask. If you have a question and we don’t have an answer, we’ll at least know who to go to and ask the question. That’s just what we need from students, for them to let them know what they need from us. Technique: What communication channels are open for students? How can they let you know? Jen: Both of us are always open by email, in that case if you just go to sga.gatech.edu, if the website gives you nothing else, you’re going to at least know who Jeff and I are and if you want to contact us. Our email is always there; you can always email us. We have a facebook page at Georgia Tech Student Government Association, and also we monitor reddit a lot. So usually if there’s something going on there, and we can help answer a question, we’ll try to give our two cents. So those are three pretty big ways. And the SGA office is also in the Student Center. It’s across from Subway. We have an administrative secretary who’s awesome and is always there to answer questions, and nine times out of ten there’s an SGA person in the office. If someone has a question, they can walk in and ask them. Georgia, our secretary, can answer that question, and if she can’t answer that question, then one of the students in the back can usually give the answer or point them in the right direction. Technique: What plans do you have to improve campus’s awareness and appreciation of diversity? Jen: We have a Cultural and Diversity Affairs Committee. We call them CDAC. Last year they did a lot of really great outreach with our students working with the leadership of the student organization, doing some diversity round tables, getting some conversations started amongst our student leader and our student relations. So right now, they’re in the beginning, and they say, what does it look like the institute needs this year as we have a conversation about diversity? Jeff: It kind of goes on a per case basis, so, as issues become relevant, we’re going to hold discussions throughout the year that address those. We’re going to actively search for that student feedback by holding those discussions and hosting them, but that’s not necessarily something you can plan for. It’s more of an event that happens and you address it at that point. Jen: The great thing I think about SGA is when these things come up, our affiliation is the students. We’re not affiliated with one group or the other, so when we need to talk about something, we have a broad range of people in student government to give lots of ideas and opinions and thoughts as we’re trying the program about discussion. Jeff: Like we said, there’s hundreds of us in SGA, so we cover all sorts of facets. Technique: Is there anything else you to tell us about? Jeff: Just wanted to stress LiveSafe, and committee applications are coming soon. Jen: Biggest thing. Whether someone joins a committee or doesn’t is always like outreach to us. Us reaching out, we’re going to be doing that all year. That’s what we’re here for, so just stressing how much, if they need either of us, if they need someone in our exec cabinet, always let us know, because we are definitely here to help. Jeff: We have a lot of capacity to affect student life, so if someone’s interested, they should definitely join student government if they have the chance. Committees are a really easy way to break through and get into SGA, so I encourage anyone that has an issue, or thinks they can do something that can promote student life, they should join.